A video of an adult actress getting bitten by a shark in South Florida waters has gone viral, getting over 13 million clicks on YouTube and counting. "It's a hundred percent fake," said Bryce Roher with Florida Shark Diving. Roher said the company called him first, hoping to hire him for the shoot. "We were contacted by a film production company to film a fake shark bite in order for the story to go viral," Roher said. It worked. While the company's other videos on YouTube only have a few thousand clicks, this story took off. Numerous websites around the globe picked up the story from TMZ, The New York Daily Post, to The Daily Mail in England. "They texted us in detail how they wanted the to pose a shark bite," Roher said. 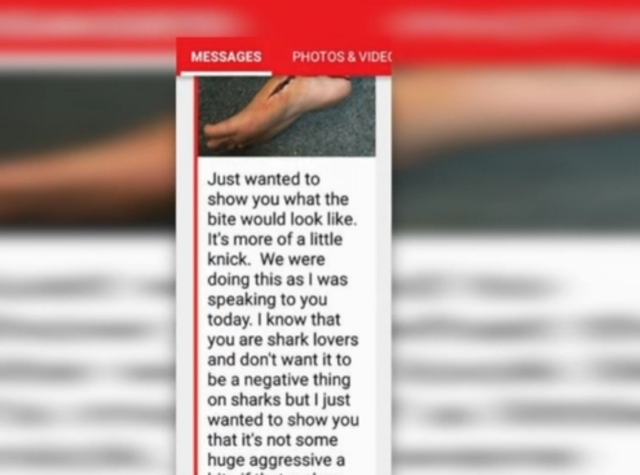 In the text message, the company included a picture of what the shark bite was going to look like. The message also said: "We were doing this (the bite) as I was speaking to you today. I know that you are shark lovers (...) just wanted to show you that it's not some huge aggressive bite if that makes any difference." Roher wanted no part of the project. Ryan Walton with Deep Obsession Charters said he is shocked the video made it on news sites. "We could tell it's fake," Walton said. "There's a shock factor that makes you want to believe it." The adult actress was in a cage when the alleged bite happened. "The fact that she was a cage made it nearly impossible (for her to get bitten)," Walton said. "And you see a diver in the water, outside of the cage, and he is fine." Both Walton and Roher are now dealing with a lot of questions from concerned customers after the video went viral. "(The video) did some damage," Walton said. It's bad news for the local shark diving industry and for a species that already has a bad reputation. "I think it's going to hurt sharks," Roher said. "Sharks are in a lot of trouble right now, 100 million are being killed a year." "(The actress) is exploiting sharks for her own fame," Walton said. "That to me is disgusting."